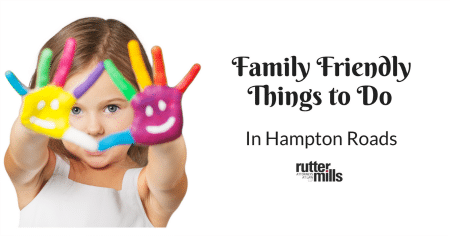 Fun Family Friendly Things to Do in Hampton Roads! If you are looking for fun activities to do in Hampton Roads with the entire family, we have compiled a list for you! These family friendly activities range from educational museums to outdoor adventures. Having fun and being safe while making memories as a family is the number one goal, Rutter Mills is here to make sure you and your family make the most of your time together. We are available to take your calls or texts 24 hours a day at 757-622-5000, or click here to email us. 717 General Booth Boulevard, Virginia Beach, VA 23451. The Virginia Aquarium believes that learning about the marine environment and conservation is an important steps to creating and maintaining habitats and animals. This aquarium is home of hundreds of aquatic plants and animals that are native to the state. They offer many things to do and see, such as a National Geographic 3D Theater, boat trips, behind the scenes exhibits and so much more! 583 Atlantic Avenue, Fort Story, VA 23459. Enjoy the sight of the first federally funded lighthouse built at the mouth of the Chesapeake Bay. This lighthouse was authorized by George Washington and overseen by Alexander Hamilton. Don’t miss out on one of the oldest standing lighthouses in the U.S.! 2500 Shore Drive, Virginia Beach, VA 23451. First Landing State Park is the most-visited state park in Virginia. Experience it’s 20 miles of trails and 1.5 miles of sandy Chesapeake Bay beach front while learning more about Virginia’s old English colonist history. Plan a day trip, or stay a few days in the park’s cabins on the beach. 829 Lynnhaven Parkway Suite 116, Virginia Beach, VA 23452. Open Jump at the Bounce House allows your child to play on exciting inflatables and plenty of places to run. A special place for smaller kids with inflatables and ride-ons is available for toddlers. Monday, January 16, 2017 from 11:00 AM until 8:00 PM. MacArthur Center Outside Area at 300 Monticello Avenue, Norfolk, VA 23510. Enjoy the outdoor Winter Carnival featuring seven family-friendly rides, including a 55-foot-tall, LED-lit Ferris wheel and a 20-foot-tall fun slide for big and little kids, along with Ocean Rage, The Speedway, Spinning Monkeys, Red Baron Airplanes and Rio Grande Train! Located outside next to MacArthur On Ice. The cost is $1.50 for a single ticket, $25.00 for 25 tickets or $40.00 for 50 tickets. Monday, January 16, 2017 from 3:00 PM until 10:00 PM. Highlights: MacArthur Center kicks off the twelfth season of ice skating at the coolest place in town. Whether it’s a family tradition or a first date, the center’s 7, 200-square-foot outdoor ice rink is the place for good times this winter. Throughout the season, enjoy public skating sessions, ice hockey clinics, figure skating exhibitions and more. Those new to the ice or feeling a bit rusty can sign up for private lessons or get a helping hand from skate guards on-site. Skate under the stars and enjoy a magical snowfall every night! Snowfall showtimes are at 6:00 PM, 7:30 PM and 8:30 PM. 3500 Granby Street, Norfolk, VA 23504. Start you day with the bears and end it with the zebras, get up close and personal with the tigers, and take a ride on the Zoo train. The possibilities are near endless when you spend the day at the Virginia Zoo. The Zoo is open year around and offers fun and exciting adventures for everyone. 5900 East Virginia Beach Blvd Suite 30, Norfolk, VA 23502. Open Jump at the Bounce House allows your child to play on exciting inflatables and plenty of places to run! 524 J. Clyde Morris Boulevard, Newport News, VA 23601. Visitors experience and learn more about all animals as well as the animals that are native to Virginia in their specialized habitats. Explore though the outdoor dinosaur dig pit to find dinosaur fossils and touch live creatures through their interactive habitats. Take tours through a group or explore the museum with your family, the fun is endless. 100 Museum Drive, Newport News, VA 23606. This museum strives to connect people to the world’s waters, because through the waters we connect with one another with our shared maritime heritage. With that mission statement the museum truly pulls together the community to learn more about their past generations and the history of our ocean. Vistiors can explore through ships, watch 3D showings in the Explorers Theater, and paddle boat through the shoreline of Lake Maury. 4337 A Warwick Boulevard, Newport News, VA 23602. 602 Settlers Landing Road, Hampton, VA 23669. This restored carousel is one of 170 antique merry-go-rounds still standing in the United States. Don’t miss out on this great opportunity to take a ride on history, reopening April 2017 and $1 per ride. 120 Old Hampton Lane, Hampton, VA 23669. This historic museum is home to the nine permanent galleries showing 400 years of development of the city and surrounding areas. With diverse contributions of the early villages, the modern city and air and space research, this museum is not one to miss. 4300 Portsmouth Boulevard, Chesapeake, VA 23321. Families enjoy bringing their children to this inflatable playground. This family friendly facility allows your child to run around and play on their own or have a birthday party with all of their friends. Chesapeake Bounce House also offers a special place for toddles to play on smaller inflatables. 825 Greenbrier Cir P, Chesapeake, VA 23320. Does you child have a lot of energy and need a place to get it out? Well come to Cloud9, they offer the ultimate extreme air experience with floors made of trampolines and foam pits. Bring your friends and make it a party! They offer birthday parties, fundraisers, corporate events, and even slumber parties! 1 Visitor Center Drive, Williamsburg, VA 23185. Take a step back in time and learn more about the people who made America what it is today. Explore Williamsburg in Colonial days but placing yourself in the town. There are activities for families, couples and friends, don’t miss out on this opportunity to go back in time. 1735 Richmond Road, Williamsburg, VA 23185. This museum is like no other, here you can experience unique attractions like no other. Ripley’s is the only place in Williamsburg where you will find shrunken heads, 12ft tall robots made of car scrap, hands on interactive activities and the spinning vortex tunnel. Don’t miss out on this mind blowing fun that will keep you on your toes! 1368 Colonial Parkway, Jamestown, VA 23081. Jamestown Rediscovery offers fun and exciting ways to learn about the 17th-century. This interactive town allows your to connect with the colonists through tours, artifacts and interactive exhibits. Jamestown offers events for kids and family or adults, it also offers an education program for teachers to plan out a lesson plan and take specialized tours.